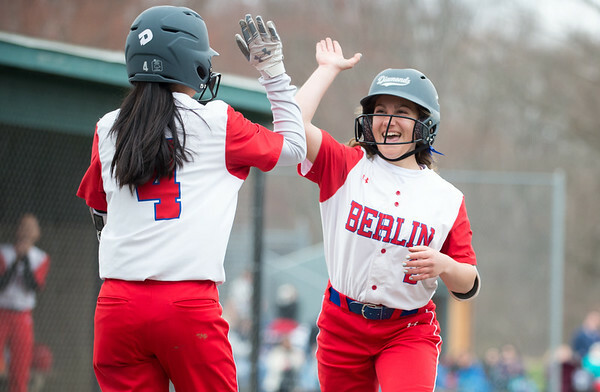 BERLIN - After the Berlin softball team’s 0-2 start to the season, the Redcoats went down south to Florida for scrimmages and a refresher before their three-game homestand. The team must have brought some of the Florida heat back with them. Berlin’s bats caught fire in a monstrous fourth inning that saw a five runs scored on five hits, including a home run by center fielder Lindsay Walsh. When the dirt settled, the Redcoats socked four home runs, including a grand slam by Jenna Zup, and 14 runs in the final three innings of a 16-5 win over Platt at Sage Park on Friday afternoon. The solid contact took a few innings to percolate, as Berlin (1-2) trailed 3-2 after three, before Walsh’s in-the-park smash awoke a sleeping giant in the rest of the Redcoats’ lineup, who tagged Panthers’ starter Caitlyn Hunt and reliever Alyssa Donohue for six extra base hits from the fourth inning to the final out. The hits began in the fourth a triple by Rylee Cop, who planted the ball just short of the left field fence. Cop scored on a sac fly off the bat of Casey Uryga before the red-hot Walsh stepped in and socked a drive to the wall in left for an inside-the-park home run, giving Berlin the lead back for good. The homer was Walsh’s third hit of the day, though she never thought it would result in a round-tripper. Still, the Redcoats weren’t done. Walsh’s homer sparked a stretch of five straight Berlin batters to reach base, starting with a walk to Jenna Zup, who later scored on a single up the middle by Kylie Lanteri. Catcher Callie Genron followed with a laser over the left fielder’s head that rolled to the fence for the team’s second inside-the-park dinger of the inning. Gendron’s two-RBI mash completed a five-run inning for Berlin, who ended the fourth feeling much better about itself than when the team took the field an inning earlier. Hart was removed with an apparent arm injury after the fourth, and the Redcoats kept their suddenly hot bats going against the emergency reliever Donohue. Uryga knocked in two with a double after back-to-back singles by Julia Ladd and Cop, and Zup followed with her second hit of the game, a two-run dinger on a hard liner down the third base line. With the bags wiped clean, Lanteri started the carousel all over again with a walk, and eventually scored on two straight singles from Gendron and Stefanie Poulin. The Redcoats tacked on four more in the sixth thanks to another home run, a grand slam into the gap in left center by Zup, racking up her RBI total to six on the day and put Berlin ahead 16-3. The blowout win was the Redcoats’ 10th in a row against Platt dating back to 2014, with the last six being decided by eight runs or more. For a Berlin team in need of a win, the offensive dominance up-and-down the lineup was the perfect antidote to a 0-2 start. Posted in New Britain Herald, Berlin on Friday, 12 April 2019 22:36. Updated: Friday, 12 April 2019 22:38.